When I’m hungry, my food moods change. I can go from sushi to BBQ within a second. 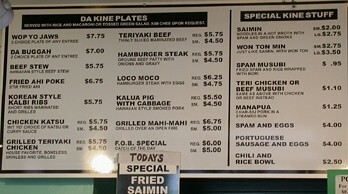 Today, at the last moment, I chose Da Kine’s for lunch. Besides it was cheap and sometimes fast depending on the weather. DaKine’s always has some a lot of beach type hanging around besides the various young Asians that want something familiar. Today was cloudy but there was some type of surf competition within sight of DaKine’s. 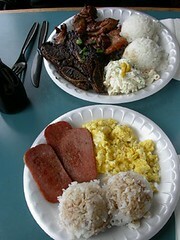 My other half always, ALWAYS gets the spam and eggs while I try to have something new every time we visit. Usually, the two of us can fill our tummys for less than $8 but today I had the ‘Da Buggah’ plate. Possibly a tad piggish of me since it was two entrees of my choice stuffed together on one plate. The teriyaki chicken is my standby but last time I was here, I watched as two teenage surfer types picked away at their ribs so I had to try it. No regrets because the ribs were super yummy and slightly sweet. But it was a bit too much with the chicken because I was stuffed and needed a nap.